As you may be aware from September 2014, every child in reception, year 1 and year 2 will receive a free school meal. 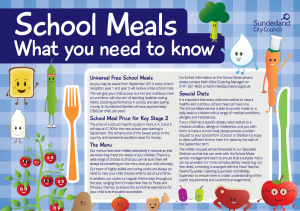 This will give your child access to a hot and nutritious meal at lunchtime, with the aim of teaching healthier eating habits, boosting performance in school, and also saving money (in Sunderland families will save approximately £360 per child, per year). The price of a school meal for pupils in Years 3, 4, 5 and 6 is £2.00 per day. This remains one of the lowest prices in the country and represents excellent value for money. Our menus have been trialled extensively in schools so that we know they meet the needs of your children. There is a wide range of choices so that you can be sure there will always be something on the menu that your child will enjoy. Our team of highly skilled and caring cooks are always on hand to help your child choose what to eat at lunchtime. 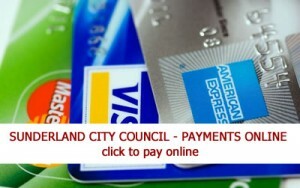 You can pay online by using Pay For It on the Sunderland Council website.